No more anti-drone eagle squads? Remember back when you could fly drones without having to pay the government money first, and when the only thing you had to worry about was a midair takedown by an anti-drone hit squad made up of highly-trained Dutch eagles? We’re sad to have to report that we probably won’t be seeing compelling videos of eagles handling rogue drones anymore, and also that the United States government has flexed its muscles and mandatory drone registration is now back on. You probably remember how the FAA finalized its mandatory drone registration rules just in time for the holiday season in 2015. Any drone that weighed more than 0.55 pounds was required to be registered before being flown outdoors, a process that involved providing your complete name, physical address, mailing address, email address, and a credit card that was charged a one-time fee of US $5. In exchange, you got a unique registration number that had to be visible on all of your drones. Lots of people were not fans of this, in particular model aircraft enthusiasts, who have been flying drones (that look much more like airplanes) for decades without having to tell the government about them. They took the FAA to court, and last May, mandatory drone registration was ruled unlawful and the FAA started giving everyone their $5 back. It’s not like this changed the FAA’s mind about whether drone registration was a good thing or not, so they did what the government does, and sneaked that mandate into the $700 billion National Defense Authorization Act, signed yesterday. This means that the drone that you didn’t have to register and then had to register and then didn’t have to register, you now have to register. Get started here. And last, the worst news. 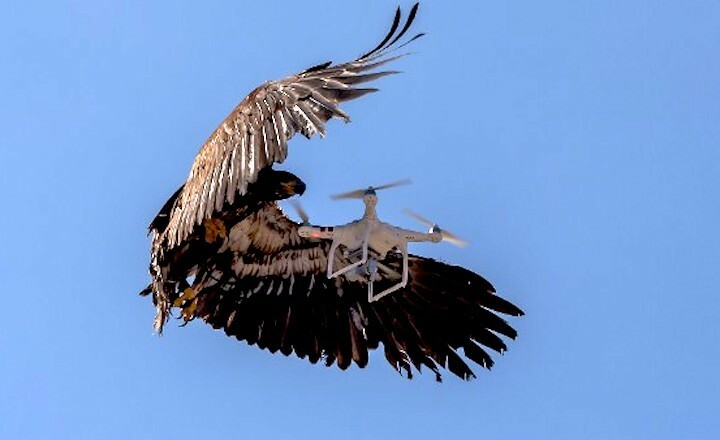 The incredible videos of anti-drone eagles snatching DJI Phantoms out of the sky on command was one of the coolest drone things we’ve seen in a while (if you’re worried, the eagles weren’t harmed, at least according to the bird experts hired by the Dutch police). But it seems that that program has been terminated. Perhaps more significant, there just wasn’t a lot of demand for the anti-drone eagle squad. Rogue drones haven’t been as much of a problem as predicted, and there are lots of other ways of dealing with them that don’t involve having to buy frozen rodents in bulk. As for the Dutch eagles, they have been taken to new homes, and we’re guessing that their new lives will be a bit more relaxing for them. No matter how many regulations are put in place, drones are cheap enough now that frequent misuse is becoming the norm. There’s no good way of dealing with a dangerous drone: you can jam its radios to force it to autoland, or maybe try using an even bigger drone to capture it inside a giant net. In either of these cases, however, you run the risk of having the drone go completely out of control, which is even more dangerous. Or, you can be like the Dutch National Police, and train eagles to take down drones for you. The video, as you probably noticed, is in Dutch, but here’s what I’ve been able to piece together: the Dutch police (like police everywhere) know that drones are going to become even more of a problem than they already are, so they’ve been testing ways of dealing with a drone in an emergency, like if a drone is preventing an air ambulance from landing. The police are looking into electronic solutions, but also physical ones, including both nets and trained eagles. The Dutch police have partnered with Guard From Above, a raptor training company based in The Hague, to determine whether eagles could be used as intelligent, adaptive anti-drone weapon systems. The eagles are specially trained to identify and capture drones, although from the way most birds of prey react to drones, my guess is that not a lot of training was necessary. After snatching the drone out of the sky, the eagles instinctively find a safe area away from people to land and try take a couple confused bites out of their mechanical prey before their handlers can reward them with something a little less plastic-y. The advantage here is that with the eagles, you don’t have to worry about the drone taking off out of control or falling on people, since the birds are very good at mid-air intercepts as well as bringing the drone to the ground without endangering anyone. While the eagles are (unsurprisingly) very competent at taking out something the size of a DJI Phantom, for larger drones the safety of the bird seems like it should be a concern: my guess is that large carbon fiber props could do damage to a bird’s legs or toes, and at least here in the United States, that would be a big problem, because eagles and many other kinds of bird are protected species. The video apparently mentions something about designing a protection system for the birds, which is good. Even so, I doubt that using attack eagles as drone interceptors will ever turn out to be a practical solution in most places, but since I got to write an article about using attack eagles as drone interceptors (! ), as far as I’m concerned, it’s been totally worth it. According to the Dutch Police, these tests should last a few months, at which point they’ll decide whether using the eagles in this way is an effective and appropriate means of preventing unwanted drone use. IS IT DANGEROUS FOR THE BIRDS? In nature, birds of prey often overpower large and dangerous prey. Their talons have scales, which protect them, naturally, from their victims’ bites. Of course, we are continuously investigating any extra possible protective measures we can take in order to protect our birds.